This simple Hot Milk Cake recipe is one of those vintage recipes that no matter which century you make it in…it will always be a hit! This cake calls for ingredients anyone would have on-hand and is great plain, with powdered sugar, alongside fresh fruit or in this case with caramel drizzled all over it, mmmm! My grandmom called this a Hot Milk and Butter Cake, and I guess it’s because you simultaneously heat up the milk and butter before you add it in to the batter. She served it plain and once I remember her making a white frosting for it and sprinkling it with coconut for Easter. Food memories are the best! This scrumptious Hot Milk Cake recipe can be whipped up pretty quick. The browning of the outside of the cake is delicious and to me the best part actually (and it goes so good with caramel). I have made a couple of tweaks to the recipe over the years, adding more sugar (since back when this cake was first being made…sugar was rationed), and I add some heavy cream to make it richer. A few years back I was lucky enough to cook with one of the best chef’s in the world – Darina Allen who owns the world-famous Ballymaloe Cookery School in Ireland. She told me that American milks, butters and creams didn’t have enough fat content to do certain recipes justice and I should always add in some heavy cream…so I listened. I teamed up with DairyPure milk for this recipe. 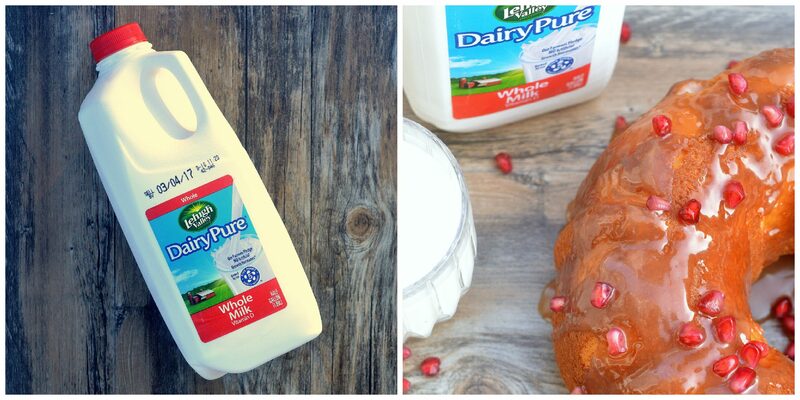 DairyPure milk is typically the milk found in our fridge. My son drinks about a gallon a week just by himself! DairyPure milk is the only milk backed by an exclusive Five-Point Purity Promise. DairyPure milk contains no artificial growth hormones, is tested for antibiotics, is continually quality tested to ensure purity, only comes from cows fed a healthy diet and is cold shipped from your trusted dairy. I feel good about buying this milk for my family and the fact that it’s made rather local to me is an added bonus! DairyPure is available in the dairy case at grocery stores nationwide in whole, 2% reduce d fat, 1% low fat and skim/fat free milk varieties. For recipes, local retailers, the full line of products, and to learn more about DairyPure’s exclusive Five-Point Purity Promise, visit: HERE. You can also follow them on Facebook and Pinterest for special offers, recipe inspiration, news and more! DairyPure whole milk was the perfect addition to this Hot Milk Cake recipe, as was the addition of DairyPure heavy cream. AND, a ice cold cup of their fresh delicious milk is a perfect compliment to a big giant slice of this cake! That is IF you son hasn’t emptied your container…Ahem! You can make this cake ahead of time and it will keep well in an airtight container. You can freeze it as well. Just don’t top it (if you even choose to top it) with caramel sauce, powdered sugar or frosting in advance, add whichever you enjoy shortly before you plan on devouring it, errr I man eat it! My kids and husband LOVE this cake! It’s one dessert the whole family enjoys! Love when that happens! Grease a bundt pan (or spring form pan) very well with spray or butter/flour. Combine eggs and sugar in your mixing bowl and mix on medium for 4-5 minutes or until batter has doubled in size and is nice and fluffy. Meanwhile, melt your butter in a saucepan over medium heat, add in milk, cream and vanilla and allow it to just come to a simmer, then immediately lower heat to low. Whisking often. Allow it to bubble for 2 minutes. With mixer running, slowly drizzle in the hot milk mixture. Once that is fully incorporated, add in your flour, baking powder and salt (premix ahead of time), add it in in 3 increments. Scrape down sides of bowl and when mixture is fully incorporated, pour it into your greased bundt pan and bake for 50 minutes. Check cake, if tester comes out clean, remove it from the oven. If not bake another 5 minutes. Repeat process until fully cooked. Allow cake to cool for 10-15 minutes, then carefully remove it (you may want to run a butter knife around gently just in case). Allow cake to cool if you decide to add icing. Food memories sure are the best. I’m confident your Grandmothers cake was scrumptious. This cake has my mouth watering! YUM! You know if the recipe has heavy cream in it, it’ll be fantastic. I had never heard of this type of cake before, but if it tastes 1/2 as good as your photos look, then send some over! I remember when my grandma use to make this cake for me. It was so good.must try it myself one day. This is the kind of cake I would enjoy! It looks so good that I’ll have to give it a try! I think you got me at the pomegranate arnils. My favorite. Yummy. I want some please! How beautiful is this cake? 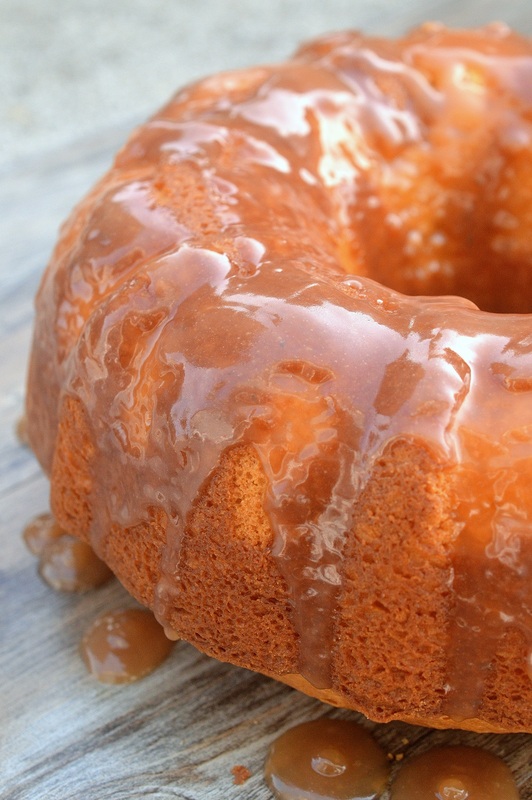 You know I have a big obsession with bundt cakes, so a vintage recipe in a bundt cake?! Be still my heart! So beautiful and looks absolutely delightful! This-makea me very hungry! Yum! I want a slice! THis sounds delicious. 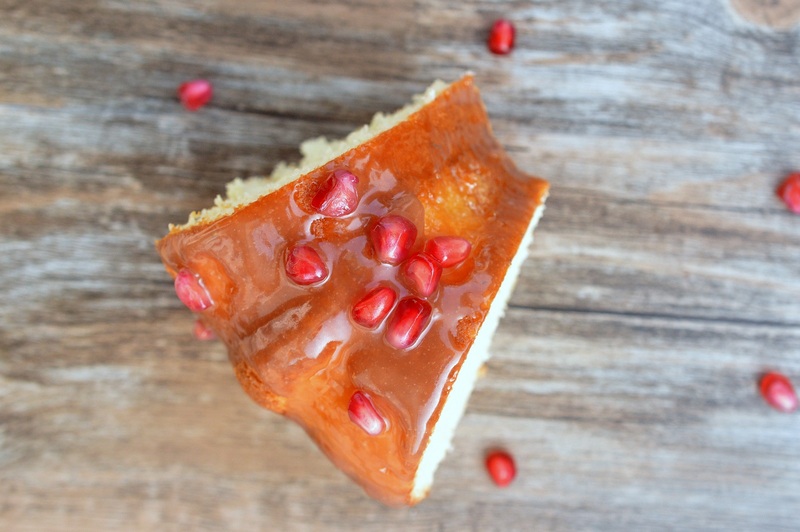 I love pomegranates but have never tried them on baked goods. Love this!! I inherited my nana’s cookbook a few years ago and just looking at her recipes made my mouth water! I bet this cake is delicious! My mouth is watering looking at this cake! I have never tried this and as I look at the picture, I want to have a piece right now. Your pictures make it look divine. Wow, this cake looks so soft and delicious! This is perfect! I’m going to a dinner tomorrow and wanted to bring a dessert! 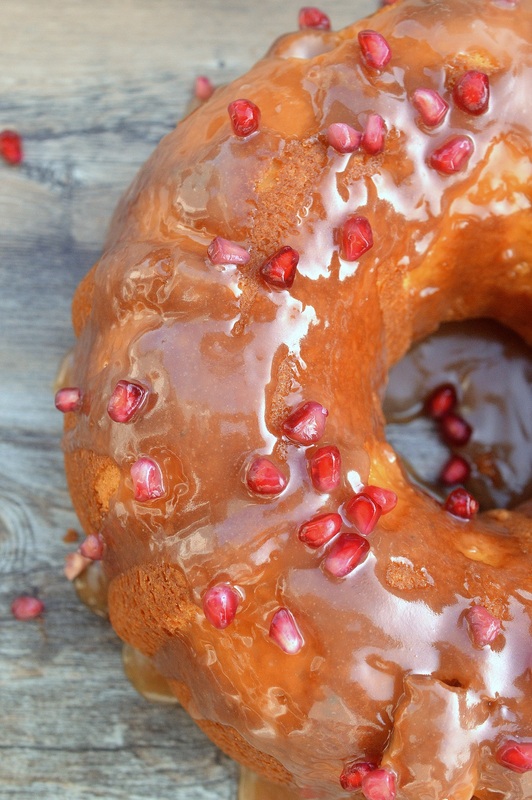 I love that caramel drizzle and pomegranate arils on top! Soooooooooooo pretty!! My gran used to make a cake like this for us on birthdays. It was one of my favorite things she made for me while growing up. Don’t you just love remembering moments and bites like that?? So nice! This brings me right back to my childhood! My grandmother made an amazing hot milk cake when I was a little girl! Oh yes! I would like a slice or two very much. It looks sooo good. Has anyone tried substituting almond extract for the vanilla? I have not since my kids are allergic, however I think that would be delicious!